OSWEGO, NY Ã¢â‚¬â€œ You could say this is a project Katherine Robinson was born to do. Katherine Robinson hangs up some of the itsy bitsy hats and booties. 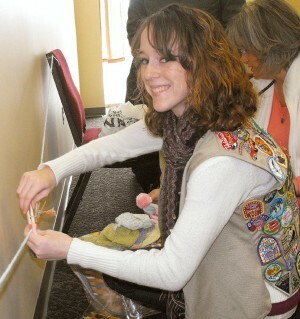 On Sunday afternoon, Katherine, a Girl Scout Senior (Troop 41) from Oswego, organized a crochet/knitting event to benefit micro-preemie babies within the community. At the event, dozens of volunteers helped Katherine make hats, booties and blankets. The “Itsy Bitsy Project Preemie Crochet/Knitting Event” attracted more than three dozen people to the community room at the Oswego Public Library. This project is the culmination of Katherine earning her Girl Scout Gold Award, the highest award a Girl Scout can earn. Katherine said she was hoping for a good turnout, but wasn’t quite sure what to expect. 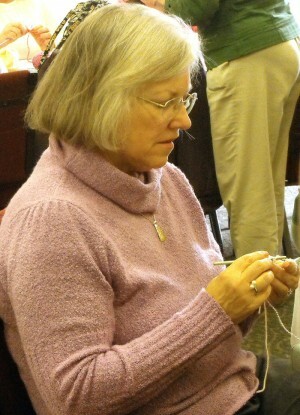 “I am very grateful for all the people who come out to help,” she said as she surveyed the room full of volunteers, young and old, who were knitting and crocheting yards of predominantly blue and pink yarns; several other bright colors were also available, reflecting the Easter season. A micro preemie is defined by the weight, usually less than four or five pounds in birth weight, she explained. One of the more than three dozen volunteers works on an itsy bitsy pair of booties and a hat for a micro-preemie. She is writing a biography that will be available in doctors’ offices and elsewhere. She weighed 1 pound, 15 ounce and one-half ounces. Born 14 weeks early, she said she weighed less than 15 golf balls. That’s exactly one box of General Mills Fiber One Honey Clusters cereal, she added. She was on oxygen for the first year after she finally came home from the hospital Ã¢â‚¬â€œ five months after being born. “When I was born, there wasn’t any preemie clothing that was tiny enough for me. Newborn clothes didn’t fit me until I was about a year old, she said. Hopefully, her project will help fill that void for preemies born in Oswego Hospital, Crouse and Golisano Children’s hospitals in Syracuse, she added. About 12 percent (1 out of 8) births in the United States are pre-term, Katherine said. The micro preemies face many health issues because their lungs aren’t developed, their eyes aren’t ready and even their skin isn’t completely developed. This isn’t the end, she pointed out. Some itsy bitsy hats and booties for micro-preemies hang on a line at Oswego Library on Sunday. They will all be donated to area hospitals. “Just because we’ve had this event doesnÃ¢â‚¬â„¢t mean we’re all done. We still have a long way to go,” Katherine said. Girls learn that anything is possible and to always shoot for their dreams, Dunne added. With the Girl Scout Leadership Experience, there are age appropriate journey series that teach girls at their age level how to Discover what matters most to them, Connect with people in their communities, and Take Action to make the world a better place, she explained referring to the Girl Scouts’ motto: Discover + Connect + Take Action = Leadership. KatherineÃ¢â‚¬â„¢s project is how she is taking action to help the families of preemie babies who donÃ¢â‚¬â„¢t have small enough blankets or hats or booties that fit them, Dunne said. 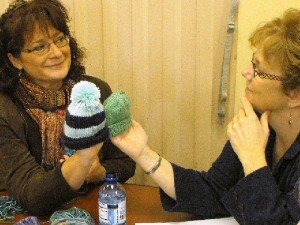 Sonjia Robinson, left, and Kelly Potter compare some itsy bitsy hats Sunday. 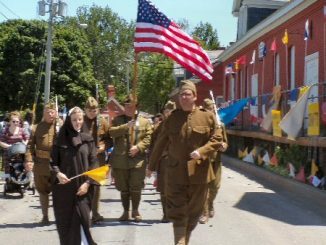 “We have girls throughout our council that are making their communities better, whether it be sending Girl Scout cookies overseas to our soldiers or adopting a family during the holidays,” she said. The journey series (ItÃ¢â‚¬â„¢s Your World Ã¢â‚¬â€œ Change It! and ItÃ¢â‚¬â„¢s Your Planet Ã¢â‚¬â€œ Love It!) are integral in the Girl Scout Leadership Experience in that girls learn from the youngest level (kindergarten) about leadership and about how to love the planet and things they can do to make a difference in their communities. Girl Scout Daisies (the youngest level) are even out planting flowers outside of libraries or in parks, or donating their cookie proceeds to a library that is struggling. For more information, or to help with the project, call 529-2751.